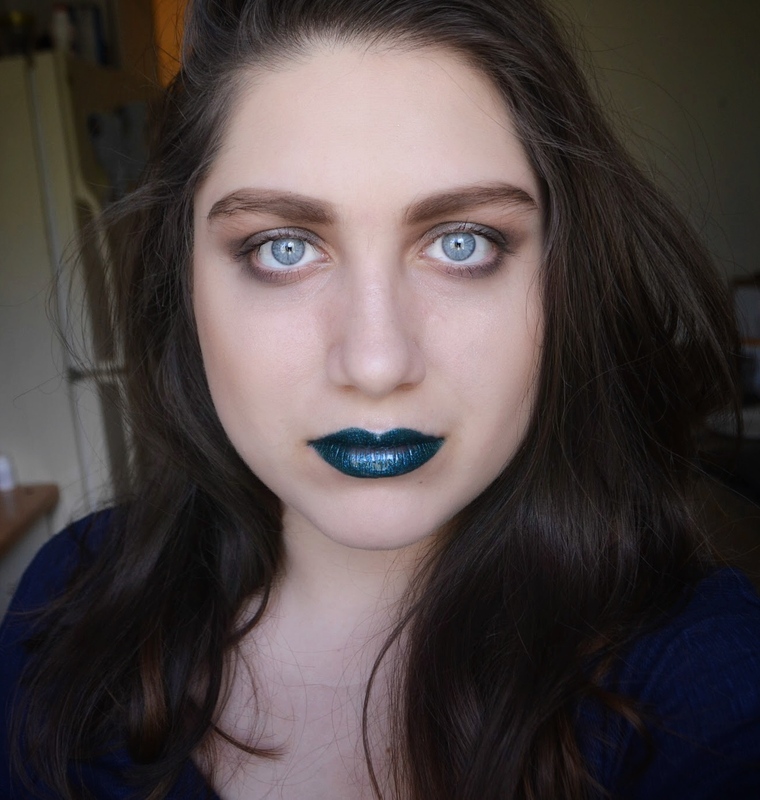 My latest Colourpop shipment came in a couple days ago, and I’ve gotten a chance to test out the products. Even though the weather hasn’t really cooled down where I live, I still purchased a few autumn shades. Maybe it’s wishful thinking, but I think the power of awesome fall makeup might just make it seem a little colder outside. 😉 So, lets see how the products look! Okay, we’re about to get real close & personal with my lips. I want you guys to see the opacity for yourself, and you can’t do that from 3 feet away. My lips are a little funny looking; my top lip is thin, and my bottom lip is fat and crooked. I’m self conscious about this flaw, but I’ll be damned if I let that keep me from showing you the products! Holy moly. When I put this on, Christmas immediately came to mind. This is the exact shade of a mistletoe berry, and it is delightful. It may be a little early in the holiday season for this shade, but it will definitely be my go-to red lips as the days grow shorter. I love how smooth it is on my lips, and it’s moisturizing qualities. However, as you can see in the picture, it feathers a bit. I would recommend purchasing a matching lip liner. This is such an adorable peachy-coral color! It’s similar to a shade I’ve just run out of – Magic Wand – except a bit brighter. I’ve worn this to class a few times, and it always matches my outfits perfectly. I may be moving it to my daily makeup bag soon. I also love the ease of application, and staying power. This sticks to my lips all day, and doesn’t come off when I eat! It is a little drying, but I’ll be fine so long as I remember to moisturize my lips. This gloss is beautifully pigmented. It was my first time purchasing lip gloss from Colourpop, and I was a little nervous. I am picky about my glosses, and I desperately wanted this one to pass the test. Thankfully it did! It is smooth, but not sticky, has the perfect amount of shine, and actually packs a bright punch of color. Love it! Okay, let’s move on to the two eyeshadows I purchased. This is definitely an interesting color. From one angle, it looks like a gorgeous plum color… From another angle, the brown glitter reflects and it looks very bronzy. For my photos, I could only get the plum to show up. It is a very complex shadow, and I am interested in seeing how it complements different outfits. Just like all Colourpop shadows, it is very creamy and best applied with your fingers. Yes, I spelled that right. 😉 I love, love, love this shadow. It is such a deep, smoky bronze and is so flattering. It is perfect for autumn, and I’m going to wear this anytime I wear one of my numerous burgundy pieces. I mean, look at it! It’s like molten gold on my eyes. This might just be my favorite Colourpop shadow of all time, and by far my favorite product in this order. That’s all the products I bought from Colourpop! I was fortunate with this shipment, and didn’t receive any duds. What do you think of these shades? What is your favorite Colourpop product? Talk to you later, lovelies! Oooo! Love B & C! I’m really into the neutral look. My neighbor has a darker complexion and looks amazing in dark colors like A. Thanks for sharing!